Whenever you get together with loved ones, your day gets a little bit brighter. Whether grabbing a coffee or talking on the phone, a friendly chat is always a welcomed treat. But, the holiday season marks the perfect opportunity to do something extra special. We’ve compiled a list of fun family activities that spark the Talk of a Lifetime. Feel free to round up your friends and family to create new memories while having a blast. What is the Talk of a Lifetime? Life is full of casual conversations and small talk, but the Talk of a Lifetime provides a unique opportunity to dig deeper. When you have the Talk of a Lifetime with family, you ask open-ended questions that encourage self-reflection. You’ll learn about your family’s wishes and dreams, and what they hope to leave as a legacy. Ask your grandmother about her favorite memories from childhood, or ask your father about the one piece of advice that he’s carried with him for life. These simple questions can reveal a great deal about your loved ones. You can find more information by visiting the Have the Talk of a Lifetime website. What Activities Will Spur Conversation? We’re glad you asked! Here are our favorite hands-on activities that are suitable for the whole family. Consider adding a few to the schedule for your next holiday celebration! A Gratitude Tree is a simple activity that can make a big impact. Gather fallen twigs from the yard with your family, or make your own colorful stems with pipe cleaners. Attach a small piece of construction paper at the top of each branch and instruct each guest to write something that makes them grateful. Arrange all of the contributions in a vase or other container. Make a Holiday Time Capsule to keep a record of all your favorite family memories. Get a sealed container and load it up with family recipes, newspaper clippings, photographs, and anything else you’d like. Seal the capsule and tuck it away in a safe spot until you’re ready to relive the past. Create a Holiday Memories Tablecloth to brighten up your holiday feast. Pick up a plain white tablecloth or runner, and set out a bin of multicolored pens. Guests can take turns writing down favorite memories from the year and sharing these memories with others. Activities are a great way to spark the Talk of a Lifetime. 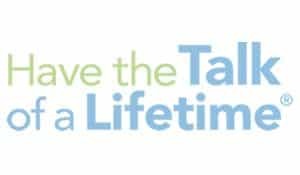 Have the Talk of a Lifetime provides several great tools to help families have their Talk of a Lifetime. Visit Talk of a Lifetime for resources including a Holiday Guide that will help you and your family Have the Talk over the holidays!